Winter has come in fairyland, too, you know, and there's one cute dolly there who simply adores this time of the year. That's right, this fantasy cutie here loves snow and dream wintery sceneries and she definitely adores defying the cold weather wearing girly chic, adorable winter outfits and pretty, fluffy winter accessories, too! What would you say about styling her up for her “fun in the snow” time today, getting the winter fairy doll dress up game started, putting together that pretty, pretty, baby doll fashion look that will keep her warm and... chic when facing those below zero degrees! Curious to check out her dolly chic tops first? You'll get to dress her up with lovely chic fur trimmed tops, with adorable snowflakes patterned ones, with chic bow tie blouses and adorable puff sleeved ones. Too hard to make up your mind? Wait until you face the “challenge” of pairing all these charmingly chic wintery tops with some pretty baby doll flouncy skirts! 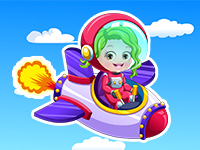 Then, you will certainly come to the conclusion that this is one of the cutest doll dress up games for girls, one of the most inspiring from a fashion point of view, of them all! They're all so very girly adorable and wintery chic, ranging from cute balloon miniskirts to chic full-skirts or chic knee-length knit ones! While you're here, in Dollyland, scanning through this charming fantasy sweetie's winter wardrobe, you simply could not miss the chance of getting her styled up in some of her super pretty dresses, too! Go for the high waist, full-skirt sheer pink baby doll dress, then pick the multicolored, polkadotted one, then the chic ruffled, full-skirt vivid green dress and... decide upon the final one for her to defy the freezing cold with...tones of girly chicness! Finish off her sweet dolly winter fashion looks with lovely fluffy winter hats or other cute head accessories, with candy colored gloves and lovely pattern socks, and keep in mind to scan through her entire baby doll shoes collection, too! If doll games for girls are one of your top favorite types of girl games, you will no doubt grow addicted to this heart-melting cute dolly and her adorably chic fashion collection, too! Go for a girly sweet double pigtail hairstyle or for a charmingly chic high chignon, for a so very cutie cute animal-shaped toy, as well, and our winter fairy doll here will be ready to build snowmen, to ride her magic sleigh or for any other type of fun winter activities along with her cute dolly friends, looking prettier than ever! Are you a big, big cute doll dress up games for girls fan? Well, then why should you stop here, when we're having lots and lots of other sweet dress up games featuring adorable baby dolls, waiting for you to enjoy them right here, on Rainbowdressup?